Get Ready for Spring in Claremore! Spring Break for the Kids! Think spring in Claremore! The days are getting warmer which means spring is just around the corner. Events are gearing back up in March so you will have a great variety to choose from. Find details on all the great upcoming events in Claremore on our website, visitclaremore.org. New this year is the 4-State Bow Bash featuring high school archery competitors from Oklahoma, Arkansas, Missouri and Kansas. They will compete at the Claremore Expo Center March 10 and 11. Are you looking for fun activities for the kiddos during spring break? Will Rogers Memorial Museum has a variety of fun activities planned daily from 1:00 to 3:00 pm March 13-17. Some of the things you can look forward to include writing like Will, behind the scenes tour, aviation fun, and Friday will end with a talent show! All children 17 & under will be admitted free during spring break week thanks to a donation from Win and Kay Ingersoll. Celebrate St. Paddy’s Day in Historic Downtown Claremore with a Bangers & Mash lunch featuring Irish entertainment and in the evening will be the Street Party. Both will take place on Friday, March 17th. Don’t forget to wear green! The Claremore Home & Garden Show is back March 24th through the 26th at the Claremore Expo Center. Get ready for spring by connecting with vendors you need, seminars on gardening and more, storm shelter giveaway, kids crafts daily and plant sales benefiting our local FFA Chapters and Master Gardeners. Dress up for an afternoon of fun and High Tea at the Belvidere Mansion on Saturday, March 25th. 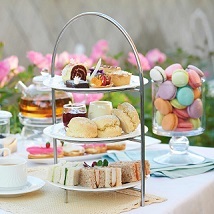 Dine on specially prepared tea sandwiches, sweets and savories. Drink specialty teas to your heart’s delight and enjoy time with friends. Tickets are $25 and must be reserved in advance by calling Patrick at (918) 688-0651. The event supports ongoing restoration projects of the Historic Mansion. If you are looking for thrills head out to Cherokee Casino Will Rogers Downs for live horse racing! Racing will be every Monday, Tuesday and Wednesday in March; post time is 1:15 pm. The last weekend of March brings the Claremore Kennel Club Dog Show to the Expo Center. More than 1000 dogs and owners will be in Claremore, Oklahoma from all over the United States. You can come out to watch multiple rings of showing and pick up some great supplies from vendors. Stay informed on what’s upcoming in Claremore. Visit our website www. visitclaremore.org. Get social on Facebook, Instagram and Twitter with VisitClaremore.